Even in the remote Yellowstone-Teton nook of Idaho where I was born and spent my early years there was no shortage of national heroes as I entered grade school in 1954, but none was more famous than scientific researcher Dr. Jonas Salk who had produced a vaccine against polio two years earlier that was being tested nation-wide that year with the inoculation of school children. He was right up there with war hero and President Dwight D. Eisenhower and sports heroes of mine at the time including some who were from or playing in Idaho such as Elgin Baylor, Jerry Kramer, R.C. Owens, Harmon Killebrew and Vernon Law. Salk, who would never win the Nobel Prize and was rejected by the National Academy of Sciences, would rival in fame two of my other national heroes at the time, Mickey Mantle and Jackie Robinson as well as two then-college heroes Johnny Unitas and Jim Brown, and a couple of high school basketball stand-outs you may have heard of, Jerry West and Oscar Robinson, all destined to be legends. Polio had ravaged the nation during the first half of the 1900s, even afflicting a young Franklin Delano Roosevelt in 1921. But it wasn’t until 1938, six years after FDR was first elected President of the United States, that research into a cure and prevention began in earnest, just as Salk was entering medical school at New York University which didn’t have the quotas common at the time for students of Jewish origin. In the months before I was born, Jonas Salk, a descendent of Russian-Jewish ancestors and with whom I would share the middle name “Edward,” was just settling into basement quarters at the University of Pittsburgh where he had been promised a research lab of his own to work on a cure for polio. Sometime after I was born and four years before polio would strike 58,000 people in a single season, more than any other communicable disease, in an effort to clear his mind and escape that cramped, basement space, Salk sought respite in the Italian village of Assisi. 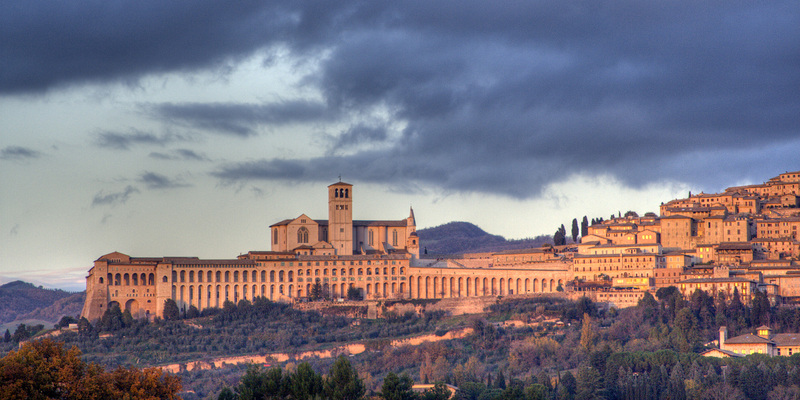 There dominating the landscape stood the 13th-century Franciscan monastery, named in that place of his birth and burial for Francesco di Pietro di Bernardone, Saint Francis of Assisi. Salk credits the rooms, spaces and views at Assisi with providing the inspiration and fresh ideas he would use to pioneer the first vaccine for polio. I don’t know if Dr. Robert Lefkowitz, the new Nobel laureate in the sciences who does his research at Duke University in my adopted home of Durham NC is as inspired by art as much as he is by sports, but Salk certainly wasn’t unusual in his interest in the arts such as architecture. Studies led by Dr. Robert Root-Bernstein, a physiology researcher at Michigan State University have looked into the role of avocations in the arts behind creative scientific discoveries among Nobel laureates in the sciences as well as members of the Royal Academy and the National Academy of Sciences compared to the general public over the more than a century. Even back in 1947, as Salk was settling into his less than inspiring basement digs at the University of Pittsburgh, a poll of eminent scientists across the nation confirmed that “80% strongly recommended fine arts training as an essential element of scientific education,” a finding not rigorously tested and validated until Dr. Root-Bernstein’s study. Neuroscientists, as noted by Emily Badger in her article for the new issue of Pacific Standard, are now looking closely into biophilic design. When Dr. Salk commissioned Louis Kahn in the early 1960s to design his Salk Institute for Biological Studies along the seaside area of La Jolla area on land granted by the citizens of the City of San Diego, California, he sought inspiration from his time at Assisi by asking for “ample natural light, views of the Pacific Ocean, and a vast central plaza." By 1984, researchers such as Dr. Roger Ulrich began making startling discoveries that confirmed Salk’s beliefs about Assisi, finding that the view from their window was a significant factor in post-operative recovery and the need for fewer painkillers. The late Dr. Salk’s institute has trained 2,700 research scientists and, ironically, five have gone on to win Nobel prizes. But you don’t have to go to La Jolla to see the influence of architecture on creativity. Riding a national wave of renewed interest in historic downtowns, Durham’s city center’s adaptive reuse of several million square feet of unique 19th-century brick tobacco and textile factories has fueled its growth as a center for start ups and entrepreneurs, while at the same time, enhancing the community’s emergence over the past 20 years as a top-ranked center for the creative class. Environment, both natural and built, are crucial to inspiration and creativity.